Iowa EPSDT Care for Kids is the state's federally mandated Medicaid program for children. 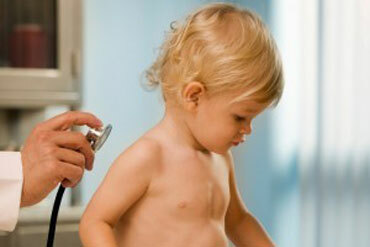 The Early and Periodic Screening, Diagnosis and Treatment (EPSDT) program was first created by Congress in 1967. Learn more about the program on our website's EPSDT Overview page. The Care for Kids health provider website is a project of the Iowa Medicaid Enterprise, and is maintained by the University of Iowa Hospitals and Clinics, Center for Disabilities and Development. Information provided on the site has been developed and/or approved by a core team that includes a developmental pediatrician, a general pediatrician, a family practice physician, and a nurse practitioner. All currently practice in the state of Iowa. In some cases, when other expertise is needed on a certain topic, additional practitioners are brought in to assist with the development and review of materials. 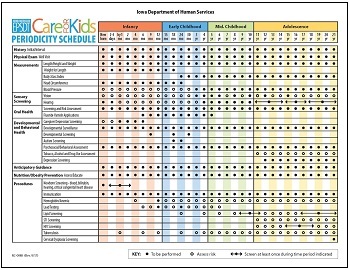 The Iowa Periodicity Schedule provides a one-page summary of the ages at which recommended health screening services are to be provided as a child grows. These guidelines are based upon Bright Futures: Guidelines for Health Supervision of Infants, Children, and Adolescents, 4th Edition, adopted by the American Academy of Pediatrics (AAP) and supported by Iowa's Chapter of the AAP. 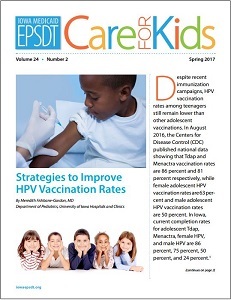 Iowa's EPSDT program publishes its "Care for Kids" newsletter three times a year, as a collaborative effort of the Iowa Department of Human Services, Iowa Department of Public Health, and the Center for Disabilities and Development at the University of Iowa Hospitals and Clinics. Preventive health screening requirements, online health screening tools, hearing screening protocols, and immunization and lead screening schedules. Three levels of care for the development of young children, and screening guidelines and links to recommended screening tools. 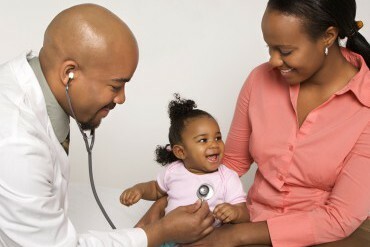 Information about mental health care for children and adolescents, and mental health screening in primary care.